Position: Start in prone position resting on your hands and feet. 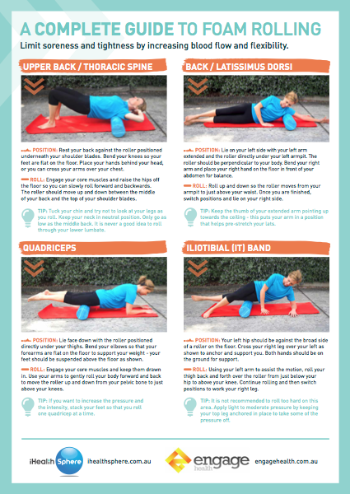 Place the foam roller underneath your quads, your elbows should be positioned just under your shoulders. Roll: Shift your weight forward, bringing your shoulders in front of your hands, to move the roller from your quadriceps to your hip flexors. Position: Sit on the roller and place it directly under your sitting bones. Cross the right ankle over the left thigh and plant the left foot firmly on the floor. Lean back so that your hands are propping you and taking some of your weight. Roll: Angle your body in different directions so that when you move your glutes back and forth across the roller it targets the different gluteal muscles. Roll each side for at least 60 seconds, applying more pressure to any trigger points and areas of pain. Tip: To help shift you forwards and backwards through the movement, press through your palms and move through your shoulders. Benefits: The gluteal muscles can become extremely tight from training, resistance exercises like squats, or even from sitting all day. Tight glutes can cause a lot of pain and they can become inactive when they are locked up. Smaller muscles often have to compensate which can cause problems elsewhere in the body, especially the knees and lower back.